What is vShare app? How can it help you to download paid apps for free? How to install vShare in non-jail-broken phones? 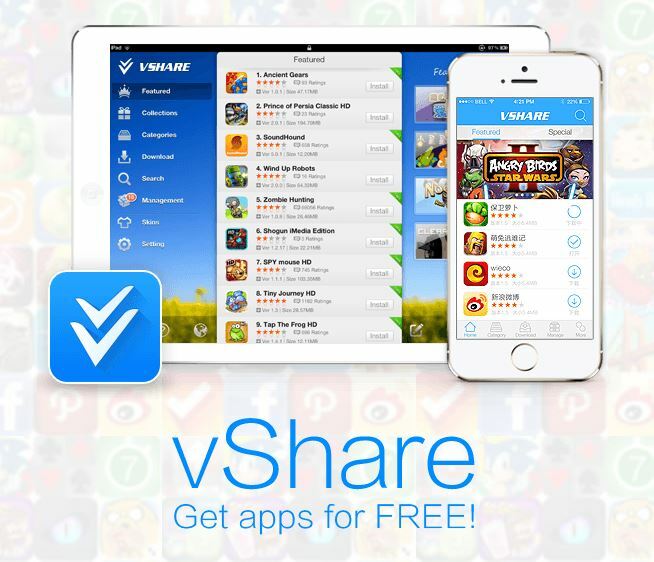 How to install vShare in jailbroken phones? Are you a proud owner of an iOS device? And yes, iPhone is much appreciated by many and is considered to be the closest to perfect phone. Also the app store is the first to receive any app before the Android store and Windows Store get them. Be you a student, a business magnet, a teacher, a professional or a photo freak, the app store has enough amount of applications to feed your hunger. But some of the apps on the store are costly and makes us think for a moment before buying them. It would be really nice if such apps have a free trial for us to test the app before purchase. Unfortunately not all apps, have this feature! So what can we do now? Jailbreak your iOS to enter the cydia store and download paid apps for free?? That’s a good solution, but won’t you be happy if I say that you need not even jailbreak your phone to download paid apps for free? Lets discuss in brief about the vShare app that can be your best friend! vShare is an excellent iOS app that is first of its kind to support jail-broken and non-jail-broken devices. The new flat interface of the app is very clean, user-friendly and is promising to give the best user experience. The apps in vShare are updated regularly and you can always get the newest paid app here. The app will be installed, and from now on, you have access to over hundreds of paid apps. Enjoy! The installation is similar, only that you need to have Appsync installed on your Jailbroken iPhone. If you face any problems during or after installation, do leave a note on the vShare forum or comment below! Disclaimer : We do not support piracy. We always recommend to download apps through iTunes legally. This article is for informational and educational purposes only.